TL;DR: We’re kicking butts over at kaggle.com! A colleague and I recently joined a kaggle.com competition in which, given a set of measurements of two variables, the point is to determine whether one is causally linked to the other. Conceptually, this is an interesting problem, and we’ve only just started hacking away at it, but we’ve already had some success. Our latest submission netted us 6th place! I feel all warm and fuzzy inside. Now, time to step up our game and move up higher! 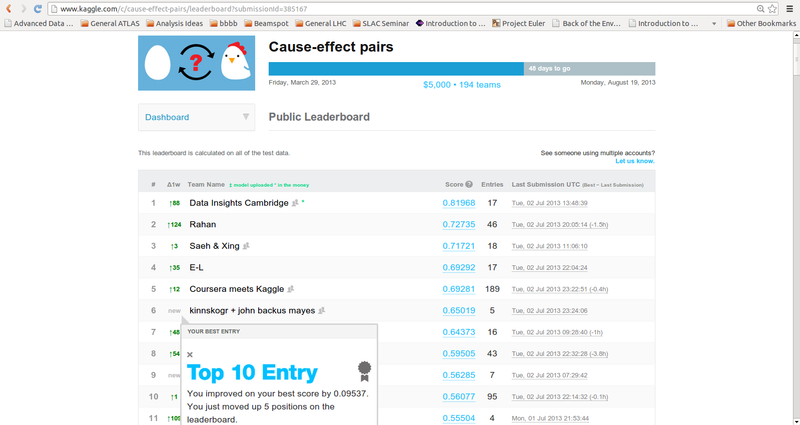 This entry was posted in Kaggle by Emanuel Strauss. Bookmark the permalink.